Brian and I made a plan about food before we ever left Indiana to head out west. We didn’t want to travel across the country and eat in the same lame fast food chains that we can find right here at home. We wanted to eat in sit down restaurants and mom and pop places. Why travel across the country and eat at McDonalds? Why miss all that local and awesome food? We knew that it might not always be possible. Travel delays and such were bound to eat up time to spend in a sit down restaurant. It was our goal, and one we would change if we had to. We had free breakfast at every motel we stayed at, so we were hopeful of finding good places to eat for lunch and dinner. I padded my trip plan to allow a little more time for meals and even found some cool places on-line for us to eat. We did well. One motel had an unfortunate breakfast, so we ended up with Subway sandwiches so we could hit the road. Day one, we did end up with fast food for lunch because of a delay in leaving. That was the only fast food we ate on the entire trip. Not bad for a twelve day trip. I won’t take you to everyplace we ate, but we’ll hit some of the highlights. Clanton’s Café. 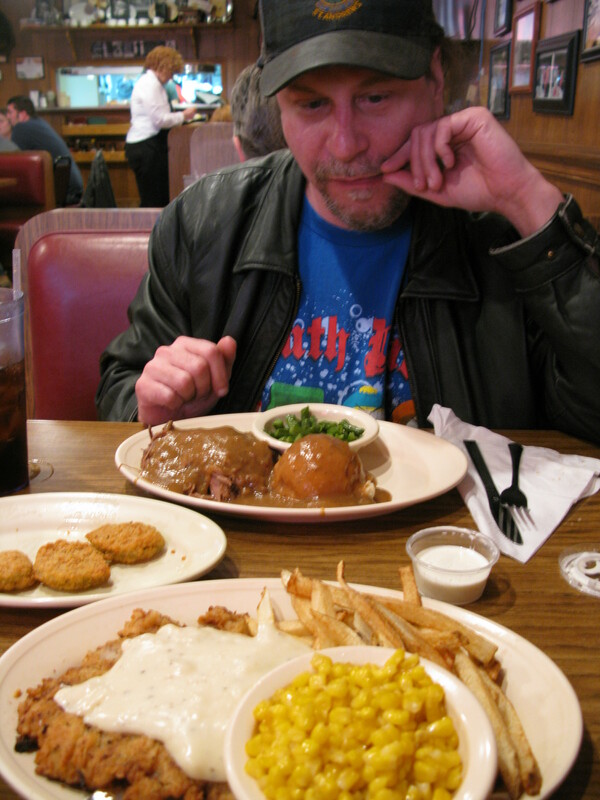 It looks like Brian is jealous of my chicken fried steak, but I was jealous of his pot-roast. Everything was homemade. No store-bought rolls or canned vegetables here. Our first night out we ended up in Vinita, Oklahoma, where I had researched a restaurant that had appeared on the TV show, Diners, Drive-Ins, and Dives. If you are ever in the area, go eat at this place! I had the DDD recommended chicken fried steak. Was is the best I ever ate? Maybe not, but it was very good. Brian had the pot-roast, which was perhaps the best I ever ate. Everything we were served was delicious and homemade, down to the rolls and the gravy. 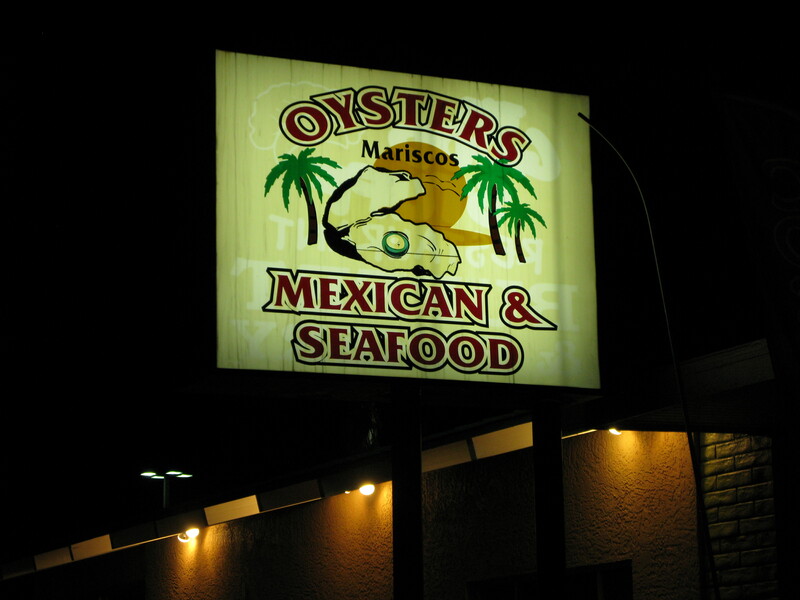 Homey atmosphere, friendly staff, and great food. Mac’s La Sierra, a place I wanted to go to ever since I saw a picture of this awesome sign. Dinner day two, a place I had been looking forward to since I found it on the web. 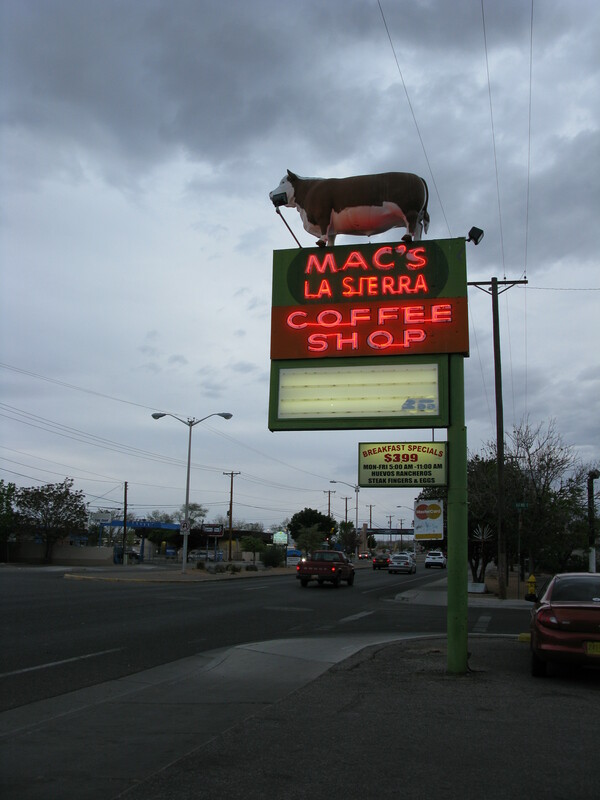 Mac’s La Siera, in Albuquerque, New Mexico. Just look at that sign. Cow! The place was packed, but they had room for us. Brian got a steak and I got fajitas. I had planned to get the trout special, but I saw someone’s fajitas, and I couldn’t resist. This is a place worth eating at, and not just because of the sign. Mac’s was also around for Route 66’s heyday, though it may have been different back then. Also on the street were some cute motels that were obviously once part of Route 66. Albuquerque takes its R-66 history seriously, and has historical markers and such up about it. No food pics, too tired. But we loved the food here. Next up, a lucky find. We ended up in Kingman, Arizona. This was a long driving day. It was late, we were tired, hungry, and grumpy. Brian and I had one of the few times where we sniped at each other, as we tried to find someplace to eat that was close to the motel. We ended up at a bar and restaurant, not quite knowing what to expect. What we got was pure awesomeness. Nice place, great staff, amazing food. I had the carnitas and Brian had tacos. It was a little pricey, but worth it. The perfect end to a long day of sight-seeing. The food was great, the place was awesome. This restaurant was here during Route-66’s heyday, and it shows. Giant half circle booths everywhere, arches, and a sitting room in the ladies bathroom. Well worth a visit. Day four- Barstow, California for lunch. We had driven all morning through the Mojave desert. On I-40, through the desert, there is little more than a rare gas station and old Route 66 ghost towns like Calico. No place to eat, fast food or otherwise. We were starving and grumpy by the time we hit Business 40, which used to be Route 66 and looks it. There’s a Harvey restaurant that’s been turned into a museum here somewhere. We saw signs for it, but never saw the restaurant. We ended up at Rosita’s. I have to say, that if you are ever anywhere near Barstow, you have to go to this place! The food was wonderful. Brian got the carnitas, because he’d been jealous of mine the day before. I got a giant burrito filled with tender pork. What I loved most was the atmosphere. This is a nice place to eat, and not too expensive, but I imagine that it was quite fancy back when Route-66 was winding its way west. 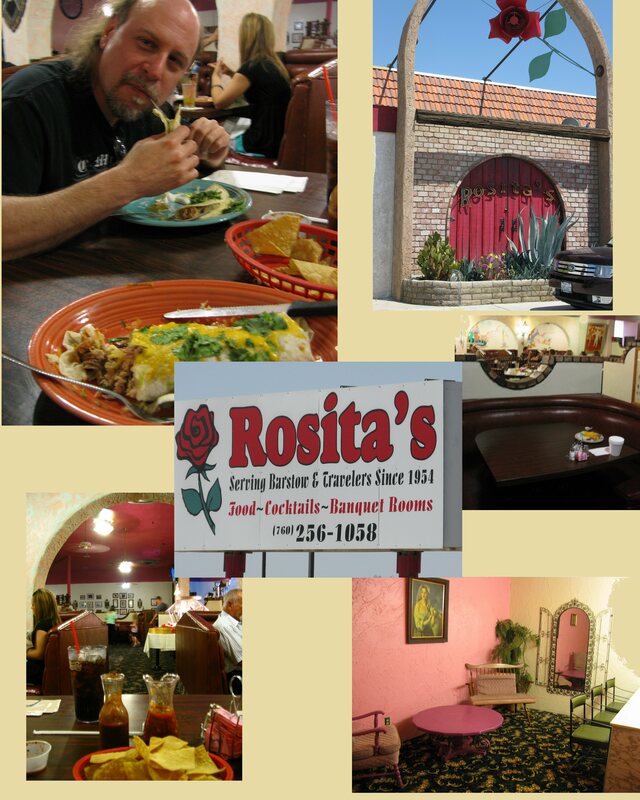 Rosita’s is something to see. The fanciest place we ate by far was Katal, in an area called Downtown Disney, which is near the parks in Anaheim. This is a fancy-smancy place. Subdued décor, as is en-vogue for pricier eateries. Wonderful gourmet food, well prepared and attractively served. Thanks to the generosity of my kind in-laws, Brian and I got to eat here twice during our stay. 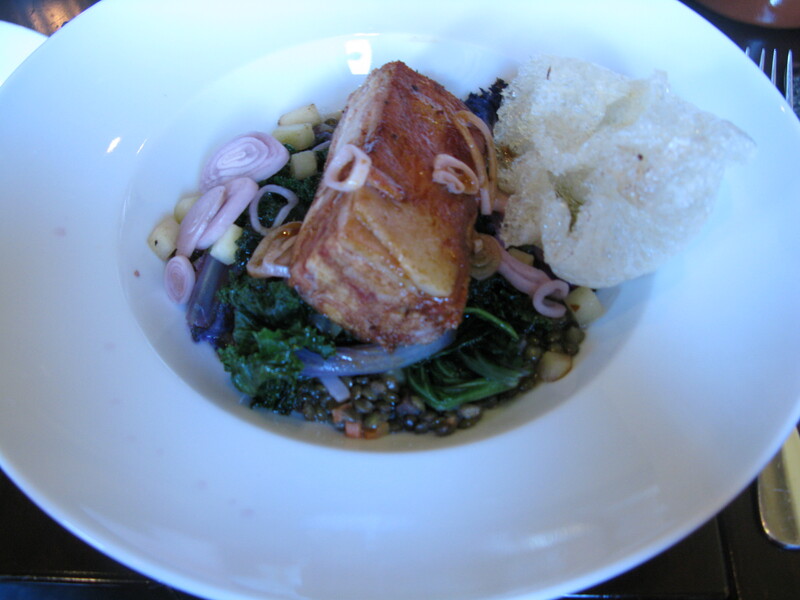 The first night, I got the suckling pig, with green lentils. I won’t even try to describe it, you should just hop a train or jet and go order it right now. The second time, I got the scallops and Brian got the hanger steak and we shared. I almost ordered the pig again, it was that good. Scotch eggs, and it was shockingly delightful. It’s amazing what a chef can do with a homey item like a Scotch egg. This place has tons of awards. After eating here, I understand why! I’ll only mention one more place, though we had some good food on the journey home. The Iron Barley in St. Louis, and also of DDD fame. 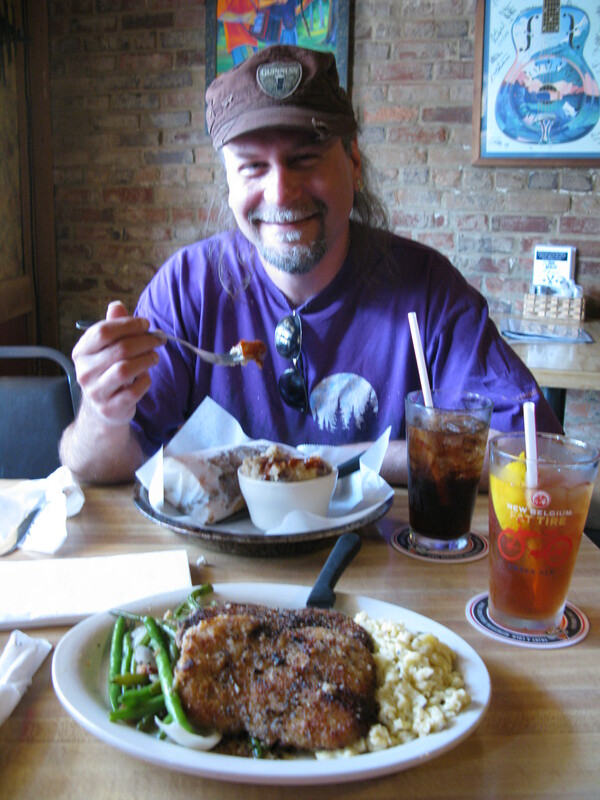 Brian got a Philly cheese steak, and I could not resist the Schnitzel & Spaetzle. I think Brian and I may have to plan a St. Louis weekend soon just so we can eat there again! I couldn’t resist the Schnitzel, but they also have an oak roasted pork that looks amazing. All in all, a great food adventure across this wide and wonderful country of ours. Instead of grabbing a fast food burger, we shared experiences and made memories. Who remembers that Big Mac they once had in Barstow? Nobody. The truth is, with a couple of exceptions, the places where we ate didn’t cost much more than fast food. Fast food is expensive these days. All it really cost us was a little more time. It was well worth the price. This entry was posted in Restaurants, Vacations, writing and tagged Eating across America, Vacation does not have to mean fast food. Bookmark the permalink. I always try to eat local when I travel. You get the best food that way. 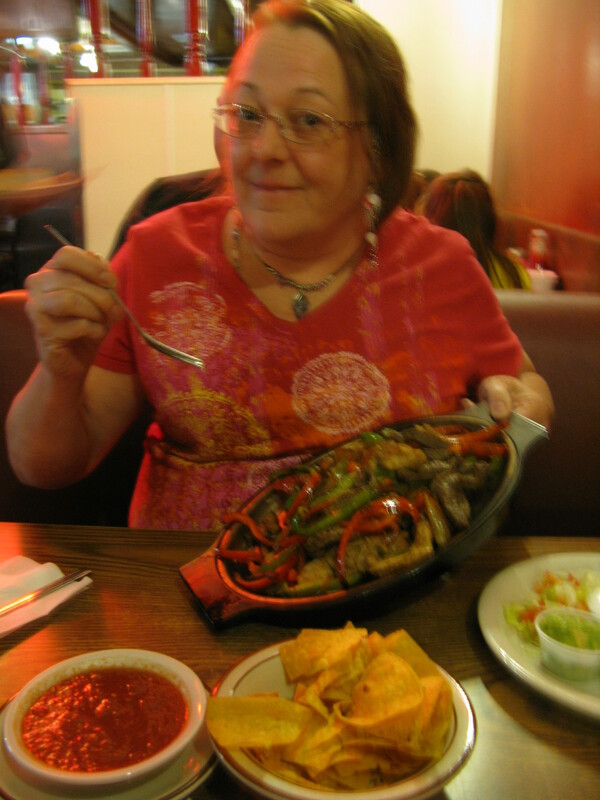 And there is a truck stop in Kingman that we would always eat at when we were OTR drivers because the food was amazing. I love foodie stories!!! We ate at a truck stop on the way home and it was lovely. I’ve been sad about the current trend of truck stops having fast food now instead of good restaurants. I love local places with fresh, homemade food and you visited some winners! (I wish a trip south was in my future after reading this post.) If you ever come to Victoria, BC you’ll have to try Pagliacci’s. Mmm–baskets of the best bread in the world accompany yummy salads and pasta dishes. Finish with a huge slab of homemade cheesecake and you won’t need to eat again for about two days! That sounds wonderful! I’ll remember that if I’m ever up in your neck of the woods.